UBER Soft Salted Pretzels - Case of 48 - (6 month Shelf Life) 1 Case of 48 Uber Soft Pretzels Increase your profits substantially with Uber Pretzels from Pretzel Haus Bakery. Old Fashion starting with only the best high-quality ingredients. Every UBER Pretzel is baked and hand twisted under the supervision of a master baker. 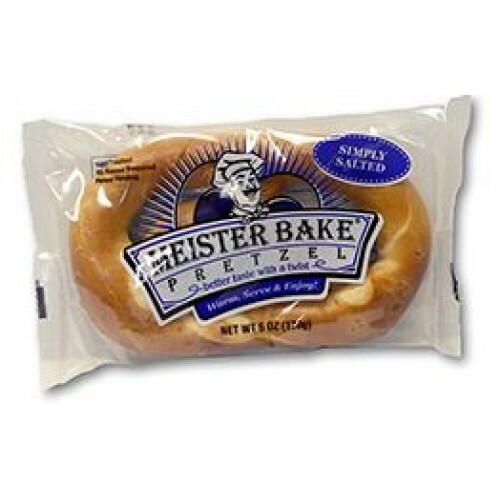 Always Soft, Moist and Flavorful - Never Frozen - Shelf Stable - Eliminates Freezer Cost Sell pretzels as they are purchased. No more borken pretzels and always fresh, soft and moist. Pretzels are individually packaged; thus requiring you to no longer carry pretzel related items (salt, cinnamon, humidifiers, etc.). Employees will spend less time preparing pretzels and more time selling. UBER Soft Salted Pretzel Haus Pretzels - MADE IN AMERICA!